The future of transportation is electric! With the massive growth in sales of electric and hybrid-electric vehicles, smart businesses, real estate developers, and institutions are providing charging stations for consumers. Allstate Electric has the specialized knowledge and experience in installing and maintaining single unit and multi-unit charging stations. Allstate Electric is one of only a handful of electricians designated in the Greater New York City area as a "preferred vendor" by Tesla. We also sell, install and service Leviton Electric Charging Stations which provide both universal and Honda and Kia branded units. Whether you need a single, home based unit for charging you car or you require a bank of chargers for customers and employees, installing an electric vehicle charging station makes good sense, for the environment and for your bottom line. Scheduled inspection of equipment for maintenance, repair, and upgrade. 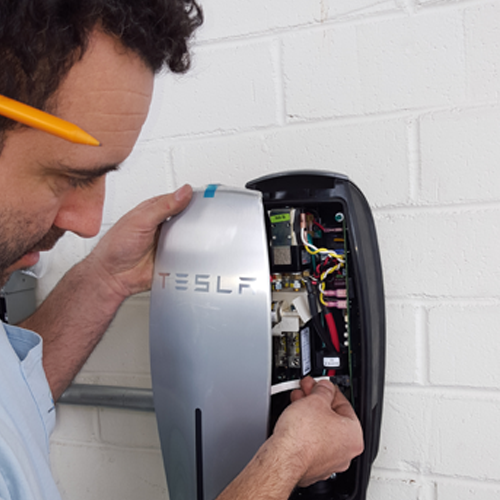 Customers who require multiple charging stations at their residence or commercial customers who want to provide their employees, clients, customers, or fleet managers with multi-unit charging stations need an experienced electrician to assist in the selection, instillation, maintenance, and repair of their multi-unit electric vehicle charging stations (EVCS). Multi-unit and fleet charging systems require specialist knowledge, both in the selection for site appropriateness and in the instillation and maintenance. Commercial, municipal, and institutional multi-unit customers may be entitled to significant grants and credits for the purchase and instillation of units.